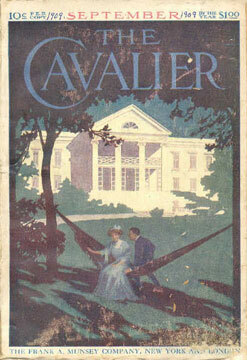 The Cavalier was published by the Frank Munsey Co. between 1908 and 1914. Launched as an all-fiction offshoot of the general-interest magazine, The Scrap Book (1906-1911), it ran for just 163 issues and was edited by Robert H. Davis. Like The Scrap Book, The Cavalier sold for ten cents and was originally published on fine book paper with refined, 'classy' covers. The magazine switched to pulp paper in 1909, and, in 1911, Munsey added in-text illustrations and traded in its sophisticated covers for more exciting, colorful images of adventure. Munsey's other publications, The Argosy and The All-Story, would adopt similar changes in the following months. 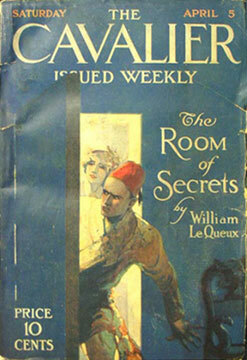 In January 1912, The Cavalier absorbed its predecessor, The Scrap Book, and became the first weekly pulp. It temporarily adopted the name The Cavalier and The Scrap Book. Over the course of the magazine's brief, six-year run, it maintained low circulation numbers—typically no more than 75,000. Nevertheless, it participated in many significant developments in early pulp history, including experiments in publication and trends in fiction. Between 1908 and 1914, The Cavalier published over 40 scientific or fantastic stories. Contributors included George Allan England, one of the leading writers of scientific fiction at the time, and Garrett P. Serviss, a journalist, writer, and lecturer on popular science who Mike Ashley has dubbed a "forerunner of Isaac Asimov." On February 17, 1911, The Cavalier introduced The Occult Detector, written by Salt Lake City doctor, J.U. Giesy, and Cincinnati lawyer, Junius B. Smith, featuring Semi Dual, a detective who uses psychic sciences to solve cases. A blend of scientific and detective fiction, this series became a staple in Munsey pulps for over twenty years. Another example of The Cavalier's interest in experimenting and stretching the boundaries of reading was its bilingual series of English-language stories presented alongside Esperanto translations. The series was short lived, and only five stories were translated (August 10, 1912-February 8, 1913). Other well-known contributors to The Cavalier included William MacLeod Raine, Albert Paysun Terhune, H. Bedford-Jones, Zane Grey, and Johnston McCulley (creator of 'Zorro'). Djuna Chappell Barnes—modernist author of the experimental novel Nightwood (1936)—contributed numerous poems to the magazine between 1912 and 1914. In May 1914, The Cavalier was merged with The All-Story, and for a brief time was known as All-Story Cavalier Weekly. 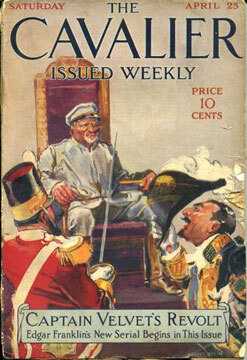 Following the merger, Bob Davis dissolved The Cavalier's four-page reader comment section, "Heart to Heart Talks with Our Readers"—a feature of the magazine since March 2, 1911—and the Cavalier Legion, a brotherhood of readers established on December 28, 1912 which, according to Sam Moskowitz, inspired Adventure magazine’s own widely popular Legion, started in 1914 by Arthur Sullivan Hoffman. The union between the two magazines did not last long, and The Cavalier was absorbed by All-Story in May 1915. Ashley, Mike. The History of the Science-Fiction Magazine, Volume I: The Time Machines. Liverpool: Liverpool University Press, 2000. Moskowitz, Sam. Under the Moons of Mars: A History and Anthology of “The Scientific Romans” in the Munsey Magazines, 1912-1920. New York: Hold, Rinehart and Winston, 1970.